I think everybody loves a good hack! 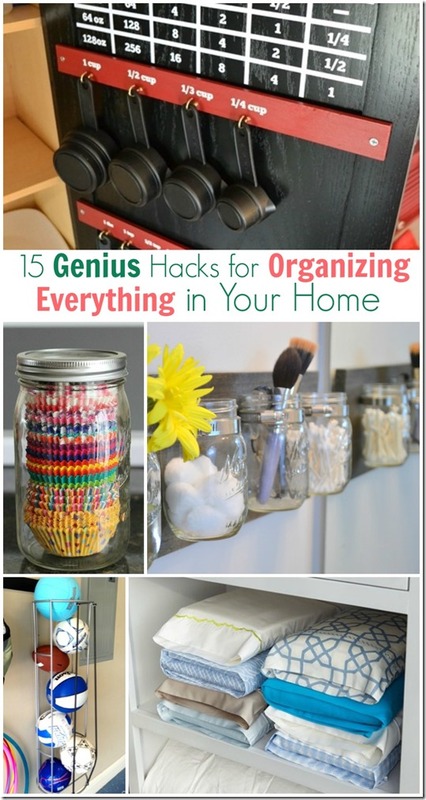 So many are getting their homes organized and ready forge ahead in the New Year, so I thought it would be fun to put together a round up of these 15 genius organizing hacks for your home. Maybe one is just right for you! Umm me? My Christmas tree is still up as we won’t be having our Christmas until a couple of weeks from now. So I’m not into the New Year yet! HA! Paper tubes at cord organizers from Listonic ~ Fantastic if you have tons of little cords! Ribbon Organizer from Spunky Junky ~ Love this Ribbon Organizer..so simple! 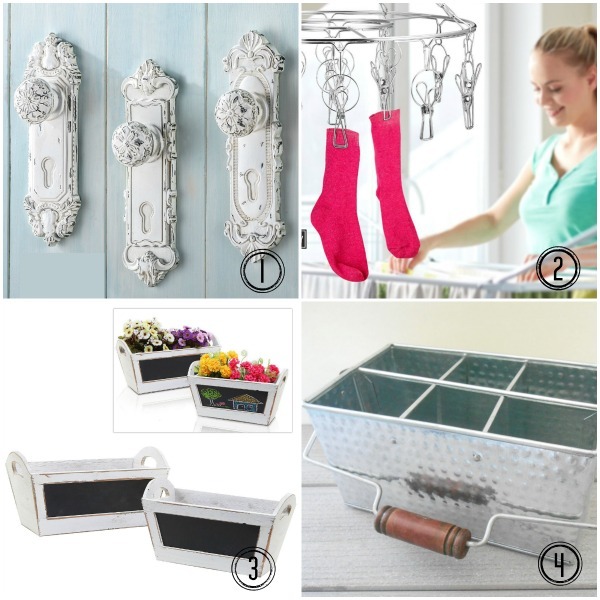 Shoe Organizer for Household Cleaners from Hailey’s Helpful Hints ~ I’ve see shoe organizers used for lots of things..but not this one! Stuffed Animal Zoo from Keeper of the Cheerios ~ Lots of stuffed animals? You gotta see this! Sports Ball Storage from Mary Organizes ~ All I can say is WOW! Charging Cell Phone Holder from Make it Love it ~ Gotta make some of these! Store Sheets Inside Pillowcases from Home Goods ~ After all these years, I would have never thought to do this with pillow cases and sheets! Mason Jar Bathroom Organizer from DIY Playbook ~ My teens need this. Trash Bags on a Roll from DIY Cozy Home ~ Great idea to keep Trash bags handy. Measuring Cup & Spoon Organization from Infarrently Creative ~ Just a tiny bit of work and boom you got it! DIY Hanging Mason Jar Storage from HGTV ~ Verrry Interesting…not much cupboard space? Try this! Gift Wrap Storage from ‘A Casarella ~ This is definitely what I need to do with all of my odds and ends of wrapping paper! For those of you that love the ideas above but hacking and DIY isn’t really your thing…below are some fun Shabby organizing goodies you may love! Shabby French Door Knob Hangers! Could be used for just about anything! In the bedroom for clothing, in the bathroom for drying towels and washcloths, for kids, teens or baby rooms for hanging..you know..stuff! Staineless Steal Hanging Rack with 18 clothes pins can be used for ANYTHING. Put in kitchen and hang pots and pans or dish clothes. But in a child’s room and use for special toys or even create a mobile! Shabby Chic Organizer Storage Crates w/ Chalk Board Side oooh so cute! Put washcloths, flowers, kitchen anything, snacks…anything in them! Shabby Chic Hammered Tin Utensil Caddy ~ Another all around useful storage caddy! Great for outdoor picnics and bbq’s or in a bathroom for toiletries! Enjoy my friends and happy organizing! 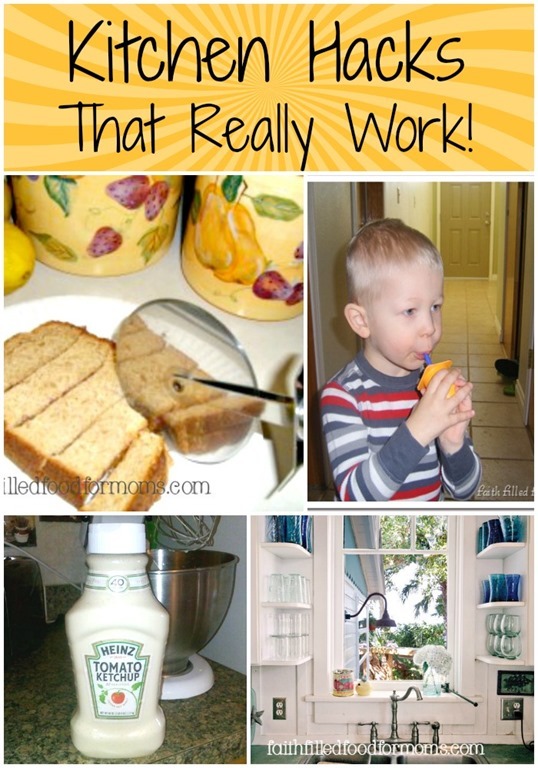 You may also like these Kitchen Hacks!